As a mother to a pre teen I always worry about her being online. We made the decision a few years ago to make her a facebook page so that she could talk to family out of state. But with her going into middle school this year I knew that we would be adding more than just family to her account. I have access to all of her accounts on the computer, but there are ways to delete messages and browser history, so I was actively seeking a way to monitor what all was going on while she was online. 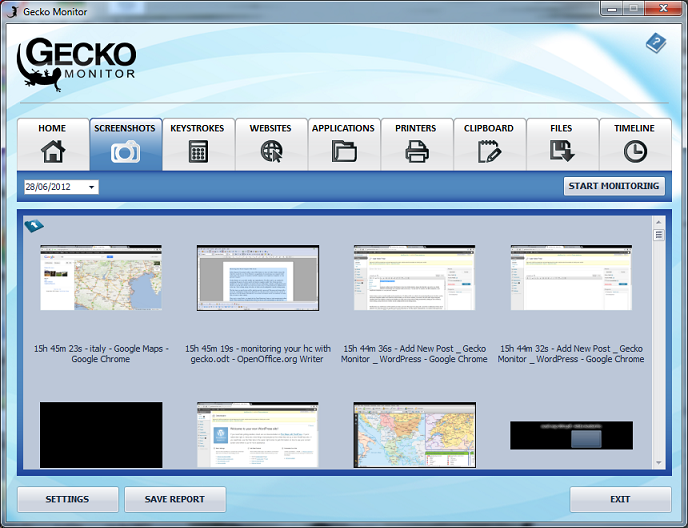 Enter Gecko Monitor Software. You simply download the software to the computer you want to monitor then go through the setup process. You can have the program run at start up of the computer, have the program run "hidden" or with an accessible icon located in your windows tray for easy access. We chose to run it both ways, Harmonie was curious of course and clicked on the icon but the software lets you set a password so there was no way she could get into the program to stop it. You can set everything to your specifications. We went with everything and had screenshots, key strokes and webpages monitored. This way we could really test everything and I felt a little safer knowing that even if a message was deleted I would have a record of it and be able to discuss any concerns with her. Takes screenshots of all windows & websites. Logs every application used and tells you when it was used. Logs every website visited and tells you when it was visited. Reports what was typed into every application & website. Monitors all printed documents, including times printed. Emails reports to you remotely & secretly, at times set by you. Innovative timeline feature - an easy to understand timeline of events. Monitors all file activity, including saved, opened & deleted files. Does all of this completely hidden, un-hides with a secret key combo.